The NFL 50 Schedule is the best way to see which teams are playing against each other this year. Super Bowl 2016 is here and now you have all the tools you need to track your favorite teams and see what the season has in store for you! This free document comes as a simple PDF file that you can print off and use as you see fit. All you need to do is fill out the scores and you’ll be well on your way to winning this season by the side of your favorite team. This template just makes is simple and easy to get started. To get started, read the guide below. To download the free NFL 50 Schedule directly to your computer, just follow the link at the bottom of this page to get started. Now, you will need to print the document to fill out the information. To print this sheet, just click “File” above, then the “Print” option from the list of drop-down menus that follow. Once you have the template on-hand you can start writing in the required information. You can also keep everything digital and track the team standings with the red tables to the right as well. Next, you will notice that the teams are conveniently listed in the order which they will face off. The dates of the games are listed to the far left of the document. When a team plays, just sit back and watch the game. When the dust settles, you can find the teams that played on the list and enter their scores in the section listed between the team names. 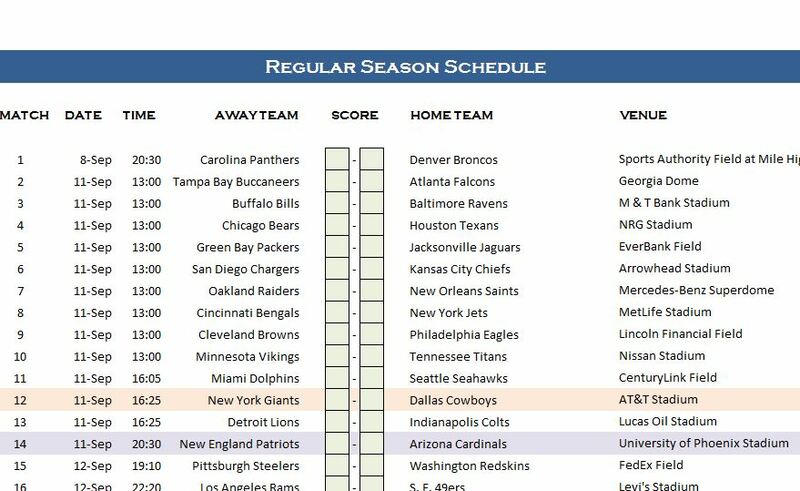 If you need to find out which teams are playing what venues, the last column of the NFL 50 Schedule gives you that information so you can see your favorite team in person by ordering tickets ahead of time. This template is the ultimate tool for football fans everywhere!